As Director of the Jefferson Landscape Architecture Program, I welcome you to our website. At Jefferson, we believe in real problems + real people = real solutions. By applying what is taught in the classroom to real life problems, our students’ knowledge and skills are increased so they can take their place in the world as engaged citizens who want to make a difference. If you have a passion for the environment and for people, our landscape architecture degree program will prepare you to address environmental problems through sustainable urban planning, design and restoration. You will learn to innovate, collaborate and create outdoor environments that reconnect us with nature, encourage healthy lifestyles and tackle climate change and natural disasters. Our hands on experiential learning increases our students’ design creativity, knowledge and skills so they can take their place as engaged citizens and professionals who want to solve the pressing problems of today’s world. You will learn to work independently and in teams and collaborate across disciplines on projects with community members, governmental agencies and environmental groups. Internships will provide you with global perspectives, a professional network and open doors to exciting careers in the public and/or private realm. Join the ranks of those that want to change the world! Under our faculty’s guidance, students and alumni secure internships and employment with some of the most prestigious firms, such as OLIN Partnership, Andropogon, Ayers Saint Gross, Oehme Van Sweden, Jonathan Alderson and more. Our 4+1 program offers Landscape Architecture graduates the opportunity to earn a M.S. in Geodesign with just one additional year of study. All of our instructors are from acclaimed landscape and planning firms. Students receive one-on-one attention from instructors due to our small design studios. Our students have internships with the top landscape architecture firms in the country, which lead to employment opportunities. Our lecture series features prominent professionals in the field. "I had the pleasure of interviewing, and subsequently hiring a Jefferson Landscape Architecture student. She is currently working with my design team. I just wanted to say how impressed we were with her portfolio, and the quality of projects arranged through [Jefferson’s] program. We were particularly struck by the human connections, and the understanding that our work is about communities and people. Thanks for preparing a good candidate! I hope to see more from the program." To request more information about the Landscape Architecture Program or to schedule a tour, please email Kimberlee Douglas, Director of Landscape Program, at Kimberlee.Douglas@Jefferson.edu, or call us at 215-951-0115. 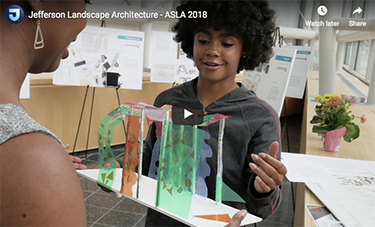 Apply for admission to the Landscape Architecture Program.